Constitutions are a kind of creation story. These political documents try to say ‘this is who we are, where we are from, and what we value.’ The United States constitution starts with ‘we the people’ and so does the Montana constitution written in 1889. This almost doesn’t make sense in a political document but it could be said that the place those people were from meant something very particular to them that was worth noting. He could have very well been writing the pre-preamble to the Montana constitution. What might it mean to be so claimed by a place that your very existence is bound there? 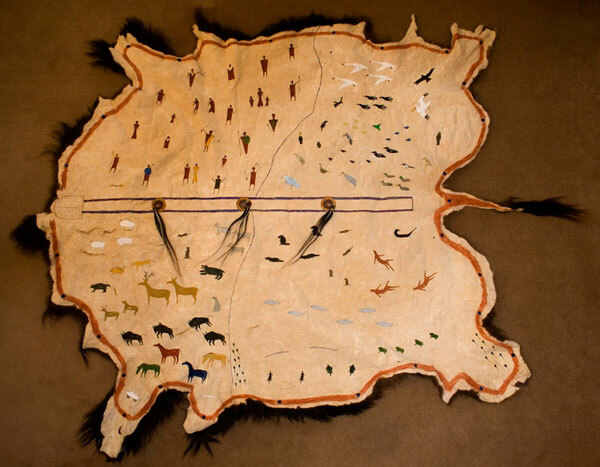 This hide painting done the good man, Mr. Norman, in traditional Blackfoot pictographic style shows the people with their relations – birds, animals, reptiles, and the whole living world who all sung each other into being. To be sung into existence. That you might be a note in a natural choir is quite a wondering. And that might be a foreign thought to you or just a little myth local to the Blackfeet people of Montana and Alberta, Canada. Might be. But you live in a world where people carry themselves as if it were so. And that itself might be part of the choir because some are singing high and others low. But to be in a world like that could be seen as a real blessing. Primal Derma is born of an ancient tradition where people like the Blackfeet and many others were so claimed by the land that they couldn’t do anything but use the fat of these animals as way of placing themselves more deeply into the Song of Life. This little jar of fat isn’t magic and won’t suddenly give you a sense of place in the world or home you. But it might be a sign post for a direction you might walk.